The official name of this poster is not known. Although this article is based on an official poster confirmed to exist, the name of the article is merely a conjecture. 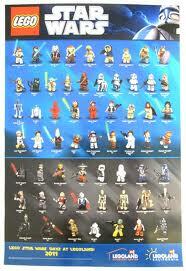 The Star Wars Minifigure Poster 2011 is a Promotional Star Wars Poster released in 2011. It is printed with pictures of most of the Star Wars minifigures of 2011. Oddly enough, Darth Maul wears a hood in this poster, even though the recent addition of a horned headpiece to his minifigure prevents him from wearing one. Facts about "Star Wars 2011 LEGOLAND California Minifigure Poster"
This page was last edited on 10 January 2016, at 06:41.